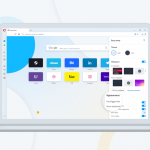 Developer 32.0.1910.0 includes improvements to the bookmark manager, a hidden feature for the heart menu and some major rethinking to sync services under the hood. 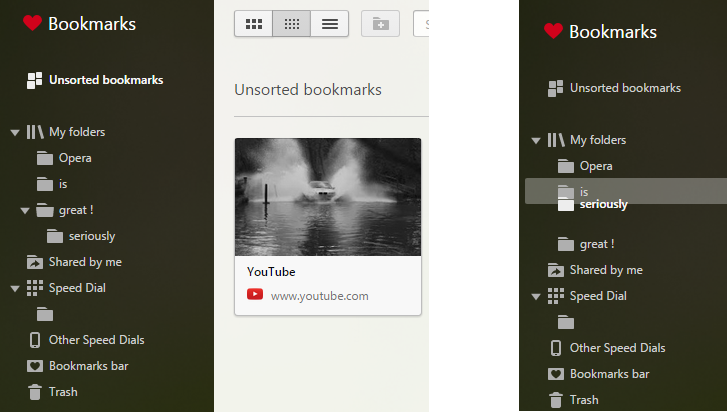 Our bookmark manager now delivers the well-known concept of nested folders in the sidebar. 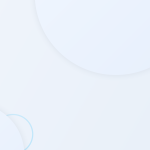 You can drag and drop folders, and expand and collapse them to view their contents. Organize your bookmarks nice and easy, as you like it to be. 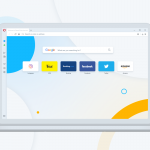 Opera developer has a hidden feature (for now), which allows you to select any area of the page that suits you best as the thumbnail used in Speed Dial or the bookmark manager. Hover over the thumbnail area with your mouse, scroll the wheel and move the image around. 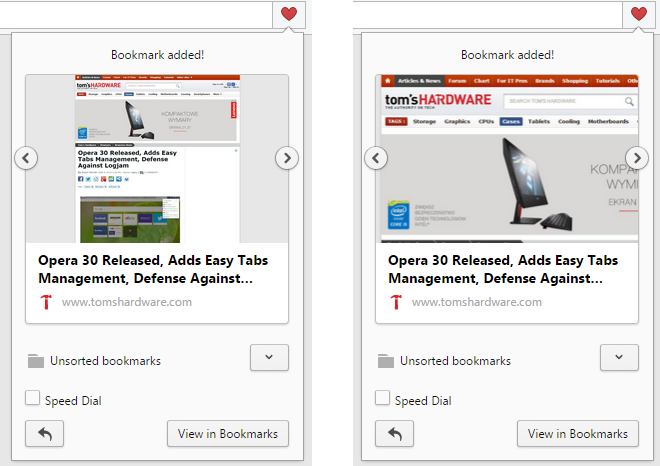 The example below shows Opera’s default thumbnail on the left. The more focused, anchored thumbnail on the right was achieved with this new hidden feature. The sync process is still a matter of heavy development. We improved both the server-side and client-side implementations of how to safely and securely sync your passwords. If you had trouble before, please give it another shot and tell us what you think. Also, we know about issues with duplicated bookmark entries. Some issues are pretty severe. Please share your experience if you are affected by this, so we can zero in on the specifics and start squashing the bugs.